← Demon Spawn: Why Do We Love Creepy Kids? 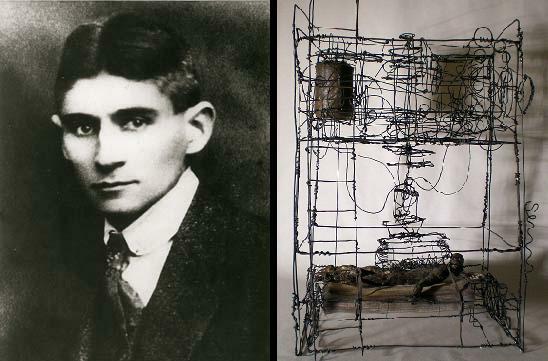 Background: Kafka was an early 20th century German-Jewish writer of grotesque, surreal stories, most famously “The Metamorphosis.” The famous short story “In the Penal Colony” was originally published in German in 1919, but it was written in the course of 2 weeks 5 years earlier. It takes place in—surprise!—a penal colony, on an island. In 1948 it was translated into English, and the “Kafkaesque” became forever embedded in the English-speaking world. What it’s about: There is an apparatus in the penal colony that is used to slowly torture criminals by carving their crime all over their body with needles until, 12 hours later, they realize their guilt and die in the midst of epiphany. This machine was created by the Old Commandant, whose followers have since been replaced by a new belief system that plans to remove the apparatus from use. A traveler comes to the penal colony to see if the apparatus should be kept or destroyed, and its most avid supporter, an officer, shows him how it works, lamenting the old days when the torture was a spectacle and everyone, children included, came to watch the great entertainment of the execution. The traveler is horrified by what he sees, refuses to help the officer fight to keep the machine running. When the officer realizes that the apparatus will no longer be used, he places himself into it, hoping for the same mystical experience that he believes the executed prisoners experience—but the machine malfunctions and violently stabs him to death. Why it will keep you up at night: There are usually a lot of layers of hidden meaning in Kafka’s stories, and this one asks some interesting questions about the nature of justice and religion; the story itself can be read as a religious allegory criticizing the Old Testament belief that everyone is a sinner who should be punished. Aside from unraveling the puzzle of the story, the haunting image of someone being publicly executed in this bizarre torture-machine is certainly disturbing and about as “Kafkaesque” as they come. Read The Metamorphosis, In The Penal Colony, and Other Stories now! I’m surprised you’ve never had to read Kafka for a class. You should pick up The Metamorphosis some time. I should also pick up a copy. I’ve always been fascinated with the nature of justice and how it is divvied out to those who deserve (or don’t deserve) their punishment. This story sounds pretty sweet. I wish I didn’t already have a million books I wanted to read! Kafka is amazing. I’m surprised he doesn’t get discussed on Horror sites more often (but then of course this is -ahem- ‘literature’, not -heaven forbid- ‘Horror’).